Every morning, the fine folks at Sports Radio Interviews sift through the a.m. drive-time chatter to bring you the best interviews with coaches, players, and personalities across the sports landscape. Today: Freddie Roach says Pacquiao will have nothing left to prove after getting in the ring with Floyd. 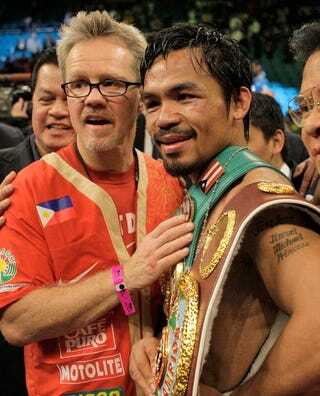 Freddie Roach joined 590 The Fan in Toronto with Bob McCown and Stephen Brunt to talk about whether or not it is possible that Pacquiao's promoter Bob Arum does not want a fight between Pacman and Money, if he felt Pacquiao won the fight against Marquez, whether or not he would take a fourth fight against Marquez, if he thinks the Mayweather fight, if it ever happens, would be Pacquiao's last, and how tough of a matchup Mayweather would be. "Possibly yeah. The thing is everywhere I travel in the world everyone tells me to make that fight happen and so forth. I talked to Manny's advisors last week and they told me they are negotiating so it's definitely a possibility and I hope that fight happens." "I thought he won by a little bit but the thing is before the decision was announced I didn't know which way it was gonna go though because it was a close fight. It coulda went either way, and if it went the other way I couldn't complain that's for sure. After watching the fight on TV I did have Manny winning by a little bit. First time in ten years Manny had a bad night and just came at the wrong time. It may be good because maybe Mayweather is licking his chops at this point." "If that makes the most sense then yeah but Mayweather is the fight I want. I think he is the biggest challenge out there and I like challenges. I think that's the defining fight of Manny's career." "I think so. The thing is if Pacquiao does lose that fight – well win or lose I think he will retire. I think that's gonna be his last fight. He's really into politics and so forth and politics is going to take him away from boxing that's for sure. Politics is something he wants to be good at. It's not like the singing or dancing and acting, that's more for fun. This is serious business and something he wants to be good at. It's gonna take 100 percent of his time to be good at that. I feel if we do fight Mayweather, win or lose I think it will be his last fight." "Very difficult fight. He is a good counter-puncher and his style does give us trouble. He does have some Marquez similarities but he's actually a lot faster than Marquez so he does pose a bigger problem. Manny, in his last fight, he kinda fell back into the realm when he fought this guy the first two times. He didn't use the improvements he's been working on to beat these bigger and better guys. He kinda went right back to what he did in the first two fights. That wasn't enough and that wasn't really effective. I think Mayweather will bring out the best in Manny. It's gonna have to because if not we're not gonna be there in the end." • Mike Tyson would pick Mayweather over Pacquiao. • Tyrann Mathieu only wants to be Honey Badger on Saturdays. • Jose Reyes says he'd play 2nd base if it meant keeping Hanley Ramirez.